HIGHLANDS An unusual oil spill that flowed off the property of ZXP Technologies and into local waterways brought environmental authorities and clean-up crews to the Highlands area this week. 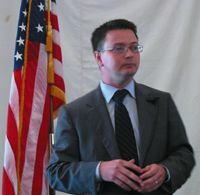 He told the audience that only about 4 barrels, or 200 gallons of various oil products, actually drippings from vehicles in the parking lots, had mixed with thousands of gallons of rain water, and through some type of error had been directed to drain off the property, instead of being sent to the on-site treatment plant which usually cleans the runoff before discharge. ZXP has a permit from the state TCEQ and processes waste water to environmental standards. The cause of the error is now under investigation to avoid any repeat of the problem. The oil in Slap-Out Gully, which runs behind the ZXP plant and down to the San Jacinto River and Burnet Bay, was first spotted by nearby houses and reported to the Highlands Fire Department. They responded, and then contacted Harris County Hazardous Materials Response team. Arriving on the scene, they also alerted the Harris County Public Health, Texas TCEQ and Fish and Wildlife, and federal EPA authorities, as well as the Coast Guard who have jurisdiction in the river. In his talk on Tuesday to the Rotary Club, Davis said that no environmental damage had been done by the spill, and that all of the agencies had signed off on the clean-up work. However, crews are continuing for a few more days to make sure all the area is clean. Davis had praise for the help that he received from all the agencies involved, and especially singled out the Highlands Fire Department for their quick response and professional work on the problem. In general remarks to the Rotary Club, not related to the oil spill, Davis reported that ZXP has had a very successful year, with employment reaching an additional 100 persons, to about 300 total. The company is now shipping their various oil products, which they blend and package, to about 70 countries worldwide. He said that the most well known product the company processes is anti-freeze, and if you purchase this in a store anywhere and any brand, you most likely have a product made by ZXP. CROSBY, TXThe Crosby Community Center invites you to attend a special community event with Harris County Precinct 2 Commissioner Jack Morman. Please mark your calendar and plan to attend Wednesday, February 22, 2012 at 9:30 a.m. as Harris County Precinct 2 begins servicing the Crosby community. Light refreshments will be served. Commissioner Morman and Precinct 2 will operate the center effective February 22nd grabbing the reigns from Precinct 4 due to redistricting after the 2010 Census. 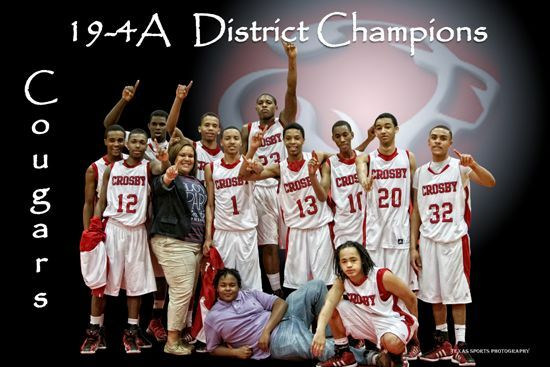 Crosby Community Center is located at 409 Hare Road, Crosby 77532. Highlands Rotary held their 37th Annual Chili Feast, Raffle and Auction last Saturday, that yearly event that brings out the whole community to the St. Judes Catholic Church social hall. The day is a festive occasion, with the participants enjoying a combination of good food, good company of family and friends, and the excitement of a raffle with a very large prize – a new car or pickup truck. Rotarians look forward to this fund-raiser all year, with everyone pitching in to help make it a success. The money raised is used throughout the rest of the year for community projects, scholarships, and international projects through Rotary International. The raffle is limited to 600 tickets at $100, to increase the odds of winning for the ticket buyers. As a result, about 1000 people come every year to eat, talk with old friends that they might not see every day, bid on auction items, and hope their ticket is the last one drawn – i.e. the Winner! This year the honor went to Stacey Graham, an employee of Woodforest National Bank in Highlands. The ticket was sold by branch manager Tonya Russell. Thirteen other prizes, worth more than the cost of the ticket, were also awarded. Rotary expects to net about $50,000 from the event, which will be returned to community projects. CROSBY  What an evening of entertainment was Saturday night when the most macho men in the neighborhood donned lingerie to raise money for breast cancer research. When Don Nelson of KTRK 13 was speaking prior to the models strutting and dancing wearing bras of various types and themes one got the feeling that he was just a little embarrassed about this being his first time for being the Master of Ceremonies of Bras for the Cause. It was a fashion show like none other that according to Shirley Rogers will contribute $25,000 to the local chapter of the American Cancer Society designated for breast cancer research and education. Gary Clifton dancing to Strawberry Fields Forever was completely psychedelic. A buffet dinner was catered by Hectors Mexican Restaurant followed by a live auction immediately after. Chuck Richnow provided music. It was put on by the Tough Enough to Wear Pink Committee of the Crosby Fair & Rodeo. 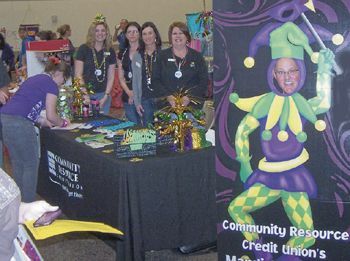 The Crosby-Huffman Chamber received compliments from vendors and visitors alike for the 2012 Crosby Expo. There were 117 vendors and non-profits who participated in the Expo and Chamber representatives said they had a waiting list this year from others who applied too late to get booth room. Winner of the Grand Prize, over $500 in cash and gifts, was Diane Allen of Huffman. This prize was provided by the Chamber and other businesses. To be eligible to win, one received a 2012 Attendance Card and had it initialized by a representative of each of the 117 booths. The participants included chamber members and non-members as well. All of participants enthusiastically greeted the Expo visitors and offered words about their organization. Many provided guests with small give-away items and some offered one or more items for free drawings to be held later in the day. We have had a good day. This is what the Chamber of Commerce is all about. 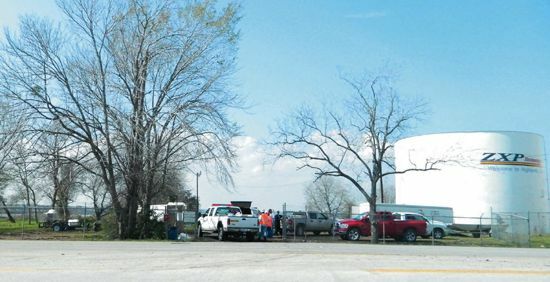 This is what the Chamber should be doing and this is what we are doing, said Glenda Logston, President of the local Crosby-Huffman Chamber of Commerce. 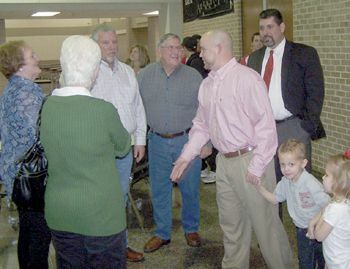 Her enthusiasm had been generated this past Saturday at the conclusion of the Consumer Expo inside Crosby High School. She joined the Chamber in August as its first full-time paid president. The Expo filled the school Commons Area, continued into the hallways leading to the North and South entrances and had booths down the hallways in two other areas. It appeared to be the largest expo of the four held over the past years, both in numbers of participants and visitors. Organizations and individuals participating in the 2012 event travelled from Liberty, Dayton, Humble, Highlands, Baytown, Atascocita, Porter, and Beach City in addition to Crosby and Huffman. Barbers Hill ISD Superintendent Dr. Greg Poole was named 2011 Person of the Year by the West Chambers County Chamber of Commerce during their awards banquet this week. 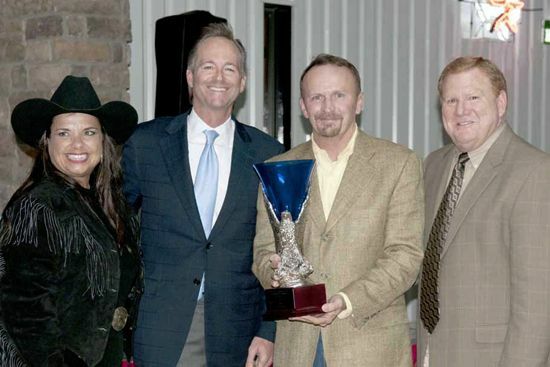 Pictured with Poole are Missy Malechek, President of WCCCC, State Representative Craig Eiland, who was 2010 WCCCC Person of the Year, and Joey McWilliams, 2011 WCCCC Chairman of the Board. Webster, TX  January 25, 2012 – Proud students and families, teachers, and principals gathered at an award ceremony to celebrate the fourteen winners of the 2012 Childrens Art Calendar contest on January 18th at Sims Bayou Nature Center on Sims Bayou. The Galveston Bay Foundation (GBF) estimates that this project has reached over 10,000 fifth grade students in its past 20 years. 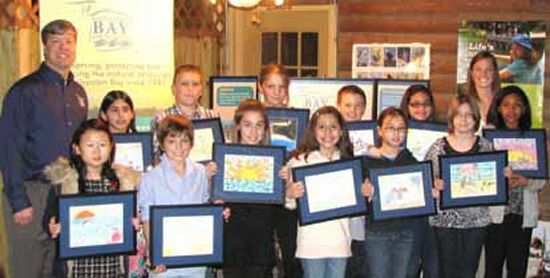 More than 440 students from 10 different schools submitted entries for the 2012 Galveston Bay Childrens Art Calendar contest. Students who live around the Bay were asked, What people, plants, or animals can you find in and around Galveston Bay? or Who uses Galveston Bay? Through their knowledge and creativity, students illustrated their answer to one of those questions. GBF would like to congratulate all of the 2012 Galveston Bay Childrens Art Calendar contest winners.